We have launched on last Oct 07 the first of a flotilla of 4 very unique, authentic and charming Sampans named “Song Xanh Cruise”, designed for travellers looking for “private” cruise experiences in the Mekong Delta. On board, two spacious spaces of 15sqm each are equipped with beautiful bamboo and rattan furniture, creating a very charming atmosphere. A very attentive service is provided by a team of 4 crew members”. 10:00: Embark on boat. The Song Xanh Sampan starts cruising from Phu An Jetty. Enjoy tea and seasonal fruit which are served by the crew while watching the landscapes and people daily life on the river sides. The boat will stop on its way for you to visit some cottage industries of the region such as a handmade brick factory in which you can observe the brick making process, see the way that they turn raw materials into rectangular bricks. Passing monkey bridge is an experience that you cannot miss when visiting Cai Be. You also visit Cao Dai temple, an attraction in Tay Ninh. It was built in 1955 when the Cao Dai Army was formed following the Japanese occupation of Indochina. When you step into the temple, you seem to be removed from the bustle of the outside world and placed into a world of calmness and peace. In Sa Dec, you take a walk around to observe an outdoor market. When coming to Sa Dec, you cannot miss exploring the highlight of this small, romantic town in Dong Thap province where the original setting of the famous novel “The Lover” by Marguerite Duras was made. The house is Huynh Thuy Le Ancient House in which the lover of the authoress lived. It is a Sino- French design with beautiful wooden furniture and floor tiles made in France. Enjoy your lunch on board while the boat cruises to Can Tho through a canal. A small boat rowed by local people will bring you to discover the rural areas in Mekong Delta. Before sunset, you come to an ancient house which was built in 19th century and have dinner in this authentic style house. Return to the boat for relaxation and then, Song Xanh cruises to Hau River. Overnight on board. 06:00: It time to wake up to experience Cai Rang floating market, the largest wholesale floating market in the Mekong Delta. This place is 6km away from the center of Can Tho city and it keeps growing to bring value to the locals in area in term of economy, culture and tourism. You can hear the bargain sound blend with the noise of motor engines and see the colors of agriculture products which turns the whole place into a lively picture. They sell different types of fresh fruit which were harvested from the orchards such as durian, rambutan, watermelon or jackfruit. You will find strangely comfortable moments while immersing in the simple lifestyle of the Vietnamese and breathing in the cool breeze of the great river. You will have breakfast on board and enjoy the scenery of the market in the morning. Remember to take some photos to capture these wonderful moments. Song Xanh Sampan keeps sailing to Victoria Can Tho. You disembark at the hotel’s private jetty. End of the tour. Note: Actual itinerary may vary depending upon river tide, arrival time or other conditions. 08:00: You will be picked up at your hotel in Saigon to set off for Cai Be. 10:00: Embark on boat. The Song Xanh Sampan starts cruising from Phu An Jetty. You begin a bicycle tour around the area to explore the surrounding and native people life. The tour stops at Le Longanier Restaurant which is decorated with colonial style furniture and is surrounded by beautiful green garden. It brings the nostalgic feeling to anyone who visits this place. Enjoy your lunch in this villa. You return to the boat to continue the journey on Mekong Delta. You will have time to visit local cottage industries which make products from native ingredients such as rice or coconuts. Before reaching to Sa Dec, the boat stops for you to take a look at a handmade brick factory where you can learn about the brick making process. Return to the Song Xanh Sampan to refresh and have dinner on board. Enjoy the view of Mekong River by night from the inside room. Overnight on board. You wake up, have breakfast on board and get ready to the second day of the tour. You disembark and take a walk around to observe an outdoor market. When coming to Sa Dec, you cannot miss exploring the highlight of this small, romantic town in Dong Thap province where the original setting of the famous novel “The Lover” by Marguerite Duras was made. The house is Huynh Thuy Le Ancient House in which the lover of the authoress lived. It is a Sino- French design with beautiful wooden furniture and floor tiles made in France. Back to the boat. The Song Xanh Sampan continues sailing to Can Tho through a canal, you can see the landscapes, some monkey bridge passing by. You also visit Cao Dai temple, an attraction in Tay Ninh. It was built in 1955 when the Cao Dai Army was formed following the Japanese occupation of Indochina. When you step into the temple, you seem to be removed from the bustle of the outside world and placed into a world of calmness and peace. Travelling on a small boat rowed by local people, you discover deeper this peaceful rural area. Before sunset, you come to an ancient house which was built in 19th century and have dinner in this authentic style house. Return to the boat for relaxation and then, Song Xanh cruises to Can Tho. Overnight on board. 06:30: We are on the way to explore Cai Rang Floating market, the largest wholesale floating market in the Mekong Delta. This place is 6km away from the center of Can Tho city and it keeps growing to bring value to the locals in area in term of economy, culture and tourism. Enjoy breakfast on board when Song Xanh is sailing to the market. You can hear the bargain sound blend with the noise of motor engines and see the colors of agriculture products which turns the whole place into a lively picture. They sell different types of fresh fruit which were harvested from the orchards such as durian, rambutan, watermelon or jackfruit. You will find strangely comfortable moments while immersing in the simple lifestyle of the Vietnamese and breathing in the cool breeze of the great river. Remember to take some photos to capture these wonderful moments. The boat keeps sailing to Victoria Can Tho. You disembark at the hotel’s private jetty. End of the tour. Actual itinerary may vary depending upon river tide, arrival time or other conditions. During the cruise, fresh cotton towels, exotic seasonal fruits, hot green tea and two bottles of mineral water will be served daily free of charge. In Sa Dec, you take a walk around to observe an outdoor market. When coming to Sa Dec, you cannot miss exploring the highlight of this small, romantic town in Dong Thap province where the original setting of the famous novel “The Lover” by Marguerite Duras was made. The house is Huynh Thuy Le Ancient House in which the lover of the authoress lived. It is a Sino- French design with beautiful wooden furniture and floor tiles made in France. Dinner is served in this old house. You come back to the boat and relax. Overnight on board. You wake up, have breakfast and get ready to the second day of the tour. The Song Xanh Sampan continues sailing to Long Xuyen through canals, you can see the landscapes, some monkey bridge pass by. Lunch is served on board. After that, we pay a visit to Tiger Island which is also called it the Ong Ho Island. It is located in My Hoa Commune, Long Xuyen City. The island had been raised by the silt of Hau River. On Ong Ho island, there is a wooden house in the middle of the garden abundant in fruit trees. The origin of name Tiger is because in the past there are many tigers and panthers residing on area of rushes and reeds. This place is the place where the second president of Vietnam- Ton Duc Thang was born in 1888. Go back to the sampan for relaxation and enjoy dinner while the boat continues cruising to Rach Gia. 10:00: The sampan will find place to anchor. Overnight on board. 07:00: We reach Rach Gia, the capital of Kien Giang in Mekong Delta region of Vietnam. Although it is usually used as a transfer point to Phu Quoc, the city is also a peaceful, nice town with low price of accommodation. Wake up and have breakfast on board before check out. Breakfast can be severed early at 6 am for tourists travelling early to Phu Quoc. End of the tour. *Note: Actual itinerary may vary depending upon river tide, arrival time or other conditions. You return to the boat to continue the journey on Mekong Delta. You will have time to visit local cottage industries which make products to earn money for their living. You wake up, have breakfast and get ready for the second day of the tour. 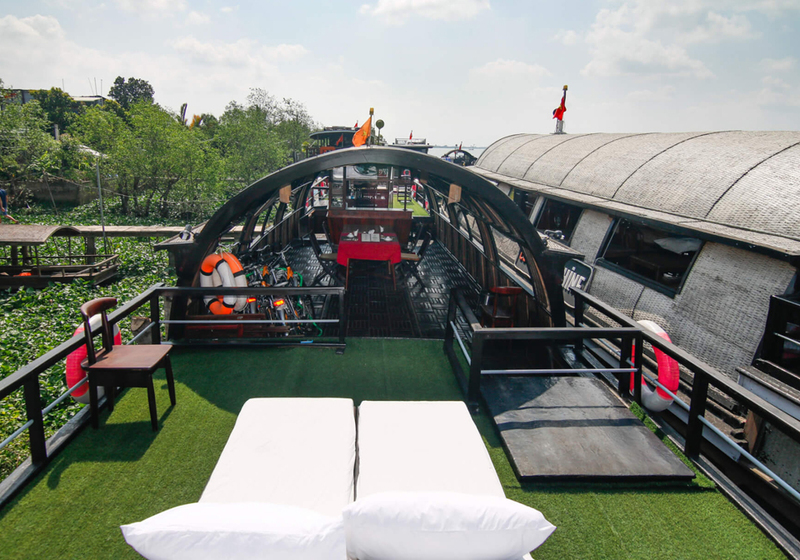 The Song Xanh Sampan continues sailing to Long Xuyen through a canal. You can see the landscapes and some monkey bridges pass by. Go back to the sampan for relaxation and enjoy dinner while the boat continues cruising to Chau Doc. Wake up and enjoy your breakfast while the cruise is heading to Chau Doc. It is the closest large town to the Vietnamese- Cambodian border crossing on Mekong river. The city is famous for owning lots of temples and pagodas which represents for people religions. Another well-known destination in Chau Doc is Tra Su Bird Sanctuary. This is an ideal location for anyone who loves nature, want to immerse into the nature world of birds. It is home for many colonies of water birds, bats and various rare endangered animals. 10:00: The boat disembarks at Victoria Chau Doc private port. End of tour Cai Be- Chau Doc. Bathroom amenities: toothbrushes and toothpaste, cotton buds, shower cap, shampoo, soap, bath and hands cotton towels. Bedroom amenities: cotton kimonos, rattan slippers, fans, double bed with silk bed covers and pillows, 2 rattan bed drawers/bedroom with 2 silk bed lamps lotus style, 1 rattan chest drawer/bedroom, 1 rattan sofa with cotton pillows, water jacynth floor carpets (bedsides and front). 1 small roawing boat attached at the back (“Xuong”) with bicycles for deeper canals discovery.